Long overdue high definition DVD release of Peter Watkins’ remarkable satire on the cult of celebrity. Best known for his controversial mockumentaries The War Game and Culloden and his little seen but much admired adventures in politically motivated cult cinema (Punishment Park La Commune) Watkins 1967 comic analysis of vacuous stardom was largely derided by critics at the time and deemed unmarketable by its backers (Universal). In the age of X-Factor however this tale of one bland pop singer’s government-sponsored climb to stardom (in order to divert the youth from more radical pursuits) seems more than a little predictive. 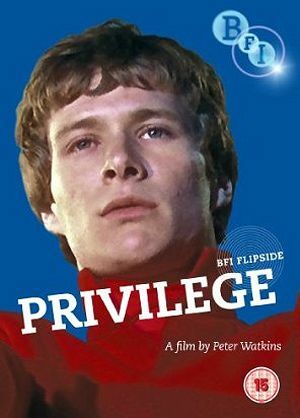 Like all Watkins’ films Privilege is a bold and unique experience, and though undeniably dated it deserves to find a new audience. Fantastic extras include early Watkins shorts The Diary of an Unknown Soldier and The Forgotten Faces and an extensive illustrated booklet with essays by Watkins, film historian Robert Murphy, and Watkins specialist John Cook.